Angelica can grow 5 to 8 feet tall, needs rich, moist, well-drained soil in partial shade. The seeds require light for germination, do not cover with soil if planning to establish plants. The plant will produce seeds only once, usually in its second or third year. If you cut the flowers back before they seed each summer, thus extending it’s life, the plant will continue to grow for years to come. Angelica is a biennial producing foliage the first year and stems and flowers the second. Flowers time is June to August. It dies back in the winter (no frost protection is necessary). Collect ripe seed in late summer and sow in early autumn. The seeds are fairly large and coated with a straw-like substance. Seeds turn from green to yellow when they are ready to be harvested. Not bothered by weeds, grows well in wild surrounded by other plants. Pruning is not necessary, but remove lower leaves if they wither. A. gigas (Korean angelica) is an exquisite ornamental introduced to the United States in the early 1980’s. All parts are a rich purple, including the deep-toned flowers. It’s an excellent contrast for finely textured tall grasses and combines well with colorful perennials. With blossoms scheduled to appear annually on the 8th of May, the feast day of St. Michael the Archangel, angelica is said to possess mystical powers against disease and evil. One reference claims this herb was named after the Archangel Raphael, who according to a 10th century French legend, revealed the secrets of this herb to a monk for use during a plague epidemic. In old-world Latvia, peasants would march into town with armloads off the fragrant herb and suddenly burst into song in languages that no one, not even the singers, understood. Like a surprising number of plants, angelica was unknown to the ancients. Although found in the northern and temperate regions of Europe and eastward all the way to the Himalayas, it does not seem to have attracted attention until the 15th century and first appeared in European herbals in the early 1500’s. Its name reflects the legend that an angel revealed its special virtues to a monk during a time of plague. Angelica wasn’t believed to cure the plague but protect against it; a piece of root was held in the mouth as an antiseptic. In Germany, it was known as the root of the holy ghost and was believed to eliminate the effects of intoxication and also to render witchcraft and the evil eye harmless. 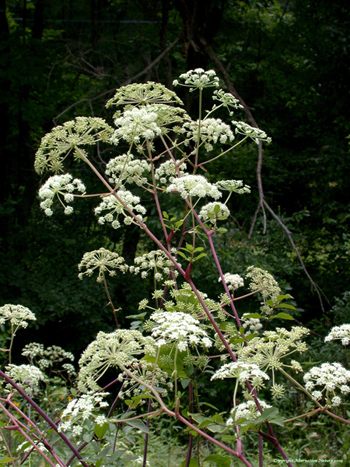 In England, where it was also known as bellyache root, dried angelica roots were made into powder and mixed into wine to “abate the rage of lust in young persons.” The plant was also given symbolic qualities: angelica stands for magic and poetic inspiration. Angelica archangelica has been identified as a suspected carcinogen in recent years. This drug will render you sensitive to light. 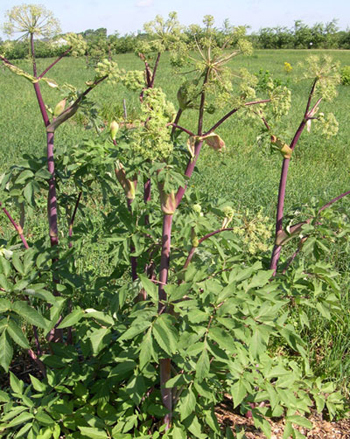 Use of angelica for a fairly long time, will cause contraindicate ultraviolet or tanning salon treatments as well as strong sunlight for the duration.